I'll never forget the first 3-day vacation we took after many years of never getting to take vacations after starting our cleaning business. I didn't yet have an office assistant, so I asked a friend if she could run our telephone timekeeping system every day while we were gone. Wouldn't you know it, as soon as we checked into our hotel, one of our supervisors called in a panic - the Timekeeper wasn't working! No one could clock in! In a panic, I called my friend and discovered that after she ran the daily reports, she had forgotten to turn on the answering function. Luckily she was able to go back and get it taken care of, but our supervisors were not happy about it since everyone was freaking out. After an hour or so of panic during the whole situation, and complaining that "it figures, we can't even leave for one day without some catastrophe happening," I decided to chalk it up to Murphy's Law. It seems that no matter what we do, there's always at least one thing that happens or one person that seems bound and determined to ruin our vacation. It never fails, right? Such is the life of a busines owner. So I decided to put together a list - Murphy's Law for Cleaning Companies, that just might resonate with those of you who have owned your business for any length of time. The day before you go on vacation is the day your best employee and/or your best supervisor will quit (or the day the timekeeping system goes down). Every solution to a problem breeds a new problem. The number of cleaners who call in sick is directly proportionate to the number of complaints received the next day. You're short-handed on your busiest day, and conversely, you're over-staffed on your slowest day. No cleaning business runs as smoothly as it may look. Your clients will never run out of things to be stolen. Supply costs only go up when business increases, thus reducing an increase in profits. You've been providing service to a client for the last 6 months, and find out your bookkeeper hasn't been invoicing the client. The number of microfiber cloths provided will always be less than what's needed. In a cleaning account, the simplest complaint will cause the most problems. The amount of equipment broken is proportional to the age of the cleaning technicians. On the busiest day of the week, the computer system will fail, the only vacuum in a building will break down, and your best cleaning technician or supervisor will get sick. You get a call from a client that their office wasn't cleaned the night before. You find out your cleaning technician showed up at the wrong location and cleaned that instead. The week you have your biggest payroll is the week your biggest check is late. The day you finally have extra cleaning technicians trained and ready to start work is the day you lose your biggest account. The more pictures you use to train your employees, the more those pictures will convince your employees to do it a different way. Allowing employees to mix cleaning chemicals is a disaster waiting to happen. The worst cleaning technicians always end up servicing the most picky clients. The day you get the flu is the same day one of your company trucks gets in an accident. You get to the construction cleaning job only to find no lights, no heat (or air conditioning), and no water. You just arrived at your second floor job of the night, only to realize you left your extension cords at the last location. Do you have additional Murphy's Laws? Please share by clicking on the Comments link below. This post is a little different from the usual posts about running a cleaning business. But with everyone using apps and online tools to run their business, I wanted to share one that I've come to rely on. I spend a lot of time at my desk and like most people, I tend to end up with different piles of paper around the office. Now my office isn't a total disaster, but I could definitely use some improvement. After a time, you start to forget what is in each of those piles, and then one day you decide to go through things and think, "Oh yes, I was going to do this and never did get around to it!" Duh, that's because it's been sitting under five other papers you've been meaning to do something with. Another one of my problems is that I love legal pads -- big ones, small ones -- doesn't matter. I'm always making lists and taking notes on things I want to remember. And guess what happens to those legal pads and loose sheets of paper? They end up in one of those piles. There is a tool I've been familiar with for years and have used it on and off, but never really got the value of how to use it to reduce the amount of paper I use in my office. And more importantly, how to reduce the number of piles on my desk! It's called Evernote. I'm sure a lot of you have heard about Evernote, and either never tried it or like me, signed up for the free version and never really used it much. I was listening to a series of educational webinars a few weeks ago, and was busily writing my notes when I suddenly stopped and thought this is ridiculous. All these notes are going to go in a pile, never to be read again. I remembered Evernote and decided to use it. So for every webinar I watched, I created a new "note" and proceeded to type my notes as I listened/watched. Another thing I love about this tool is that you can simply copy and paste graphics right into your note! Over the next few weeks, every time I found myself pulling out my legal pad I stopped myself and went to Evernote instead. Now it's so much easier to find my notes, and actually read them (because my handwriting isn't that easy to read). Evernote can do many things, and you can read all about it on their website, but one of the things I really like is that I can access my account on my tablet and smart phone. So now if I want to save a web page or refer to my notes on the road, Evernote is always there for me. If you need a little help getting organized, I highly recommend Evernote (no, I'm not getting paid to say that). In fact, I've been using it so much lately I decided to break down and pay the small yearly fee of $45 so I can set up several Notebooks with different topics. In fact I've started going through my piles and typing some of those hand-written notes into Evernote and my piles are starting to shrink - Yay! Do you use Evernote? I'd love to hear about the creative ways you're using it! Post your comments below. Have You Thanked Your Mentors Lately? This past week we went back to our roots in the cleaning business -- Boise, Idaho. We spent 15 years in Boise starting, growing, and eventually selling the business. We left in 2002 and have been back just once for a short visit, so it was a very nostalgic week for us. As we reminisced about the old days we talked about the people that gave us a leg up in our business. Two people in particular gave us opportunities that made a huge difference in the growth of our business. We decided it was time to thank these two people after all these years. We knew they were both still running their businesses in Boise, and as luck would have it, they were both available to see us when we stopped by. After catching up on what everyone has been doing for the past several years, we told each of them that we'd always wanted to thank them for the time they took to help us grow our business. Had it not been for their mentoring, we might not be where we are today. Both of them brushed it off as nothing special, but we could see in their eyes the pleasure it gave them to know they made a difference and that we sincerely appreciated it -- even after all these years. If you have any mentors from your past, I encourage you to contact them to thank them for what they did for you. Not only will you feel good about doing it, you will give them validation that the time they spent with you was worth while and really made a difference. In the end, we all just want to make a difference in other people's lives. Are You Confusing Motion With Progress In Your Cleaning Business? Most cleaning business owners are in the thick of things every day, swamped with a huge to-do list. But do you ever feel like you're riding a rocking horse? In other words, are you creating lots of motion back and forth, but never really making any progress? Some days you might actually feel like you were very productive because you were busy going from one project to the next all day long. You paid some bills, responded to emails, did some research on a piece of equipment you wanted to buy, talked to a couple clients, cleaned out your email again, made a trip to the bank, and stopped by a couple accounts to check in with employees. You were busy! Yet, you really didn't do anything to move your business forward. You still didn't take any action on that employee with the chronic bad attitude -- the one that other employees are complaining about. You didn't do any marketing activities -- in fact you skipped the monthly Chamber of Commerce networking event because you were too busy fixing a vacuum cleaner that stopped working last night. You forgot to get the monthly newsletter done -- again. And you gave up looking for that much needed supervisor because the thought of having to spend all that time interviewing and training a new supervisor is just too overwhelming. Guess what! You were busy on the wrong things! I've worked with a lot of cleaning business owners and there's one thing that I've discovered. The owners of underperforming companies almost always work as hard and sometimes times even harder than the owners of successful cleaning companies. They seem to think that as long as they work hard and put in long hours, their business will continue to grow. But that's not usually the case. It's kind of like rowing a boat as hard as you can, but rowing AGAINST the current instead of WITH the current. You're not going to reach your destination no matter how hard you row! So stop filling your day with "busy work" and tasks that should be handled by your staff, and start filling your day with projects that matter. Projects that will increase sales and profits, and that will bring you closer to your goals. If it seems you're crazy busy every moment of the day but your business isn't moving forward by leaps and bounds, then stop and take a critical look at what you're spending your time on. Look at each task you're working on and ask yourself if you're working on the most important things that will move your business forward. You only have so many hours in the day so make sure you spend those hours wisely. Does More Money Equal Happy Cleaning Technicians? 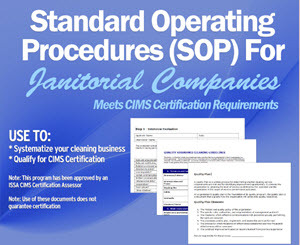 Can Your Cleaning Business Operate Without You? You've probably heard scores of people say that if you want to be successful in business you must have a passion for what you do. How many people do you know that TRULY love to clean? Sure, many people get satisfaction from going into a home or business that needs cleaning and then leaving with the space looking great. But is that satisfaction enough to make a successful cleaning business? Hardly. Why do you think the success rate of new cleaning companies is so low? It takes a lot more than the love for cleaning or the desire to make a living by starting your own cleaning business. So if success in the cleaning business isn't about cleaning, then what is it about? In my opinion it's about two things - systems and consistency. The most common claim made in our industry is "We provide quality cleaning services." It's a phrase that is so over-used, no one is going to believe your claim unless you can prove it. And the only way to truly add consistency to the quality of your cleanng is to have written systems in place that are used every day by every employee. Your written systems will ensure that for every property you clean, the same tasks will be completed in the same order and using the same route through the property -- today, next week, and three months from now. And as long as you have a consistent training program in place, any employee can replace a missing employee without causing a major upset within that account. When people talk about sytems, the typical example used is McDonalds. The key to McDonalds success is certainly not their food, it's the consistency with which they deliver their product. Of course there are many other things that contribute to McDonalds success, but they would never be able to deliver on all their successful marketing campaigns over the years had they not been fanatical about the systems they have in place to make sure the customers are satisfied. When your cleaning company provides consistent services, your clients will continue to do business with you because they can count on you to deliver on the promises you make. If you want to ensure the success of your cleaning company, you might want to borrow a page from McDonalds by putting systems into place that will ensure you deliver consistent, "quality" service. If you'd like help with getting your cleaning business on the road to success, visit our web sites, The Janitorial Store and MyHouseCleaningBiz.com. Do You Offer Exceptional Customer Service To Your Cleaning Clients? Got A Bad Attitude? Change The Way You Think! There's no doubt about it -- running a cleaning business is stressful. And oftentimes the result of constant stress is a bad attitude. Wouldn't it be great to always have a positive attitude? Not only will it make you feel better, it will reduce your stress, attract the right people to you, and increase your success. But it's hard to maintain a positive attitude with all the problems surrounding you, isn't it? It may be difficult to maintain, but it IS possible. And it starts with changing the way you think. The first step towards changing the way you think is to identify what worries you and stop letting it control you. That's because when you worry, you become preoccupied with your problems. And when you're preoccupied, you're less productive and not much fun to be around. Plus, when you bring your personal worries to work, you give your employees permission to do the same. And that's a recipe for disaster for your business. Taking time for yourself through meditation, a hot bath, a massage, taking a walk in the park or whatever makes you happy. Instead of saying: "I've never done that before", or "I can't do that." Say: "This is an opportunity to learn something new that I might end up enjoying." Instead of saying: "It's too complicated." Say: "I can break it up into smaller tasks and learn them one step at a time." Instead of Saying: "This will never work." Say: "I'll never know until I give it a try." Instead of saying: "My employees will ever go for this." Say: "How could I show them the benefits of this change?" And finally, think about the people you surround yourself with. Do they also have bad attitudes? Do you find that when you're around this type of person it tends to bring you down? If so, it's time to start surrounding yourself with more positive, upbeat people. And when looking for employees to join your cleaning company, look for attitude over experience. It's much easier to teach people how to clean than it is to try and change their attitude. Our last blog post was called: Warning About Web Site Plagiarizing The Janitorial Store. First, I'd like to thank all the people that took the time to post supportive comments here and on Facebook. Hello my name is Sean Libby and I am a customer of The Janitorial Center and I would like to call BS on this Blog of yours! First off their site looks nothing like yours and they offer way more services than you do which is why I choose to go with them. Second many services you are offering you took from them, website building??? You guys never offered that!!! I too will be spreading the word about this, YOU CAN COUNT ON IT! Remember he who has the last laugh, laughs the loudest! I'm sure you will never let this post see the light of day but now you know that others know and you can expect the same type of treatment in return. Contrary to your statement that your post would not see the light of day, I welcome the chance to respond to your outrageous claims, as they have no basis in fact. See my responses below. I never said their site looks like ours, even though there are similarities - I don't really care about similarities in the look of the site. What I care about is the fact that they took a significant amount of copyrighted content and tools from our site and are selling them on their site as their own. We can argue about the number of services each site offers but in answer to your statement -- we have been adding content to our site every week since 2004. Their site was first released in 2011 and falls well short of the amount of content and services we offer our members. Since you have never been a member of our website, you don't really have anything to compare it to. This is incorrect. I have the documentation to prove that our website service has been offered since 2009. Their "first" website was started in 2011 so they have not offered the service as long as we have. Regardless, the service we offer is different from theirs, and again, I am not concerned that they offer a website service. Many companies do. I am only concerned about the copyrighted intellectual property that they stole from us. I would like you to visit this website - http://www.waybackmachine.org. Type in our website, http://www.thejanitorialstore.com. You can view a screen shot of our site the first time it was logged as an active site on 11/5/05. 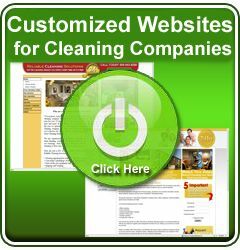 Now enter "the janitorial resource dot com" and you'll see that their site was first indexed for the first time in 2011. And if you enter "the janitorial center dot com" you'll see that it has not even been indexed yet. If you are a member of their site and have used their calculators, you can thank ME for them. I created every single calculator starting with a spreadsheet and paying a technical person to convert them to a format to be used on the internet. If you have a copy of their green cleaning ebook and a copy of their bidding and estimating ebook, you can thank ME for them. I wrote them. They changed a few things slightly, like using different graphics and changing a few words here and there, but they are mine. Good luck to you and enjoy the material you've receive from us - through them. This is not something we would normally bring up in public, but over the past year and a half we have spent thousands of dollars trying to get some very unscrupulous people to stop using our copyrighted content on a copycat website they created – to no avail. They are not only using our content and products on their website, they are trying to make money off of them. They are sending out emails to owners of cleaning businesses and will probably attempt to contact you to try to get you to join their site and buy their stolen materials. I will not post a link to the site because I do not want them receiving any links whatsoever from us or anyone else. However I will tell you that the first time they set up shop they started by copying the first part of our name, and called the site – the janitorial resource dot com. If you google their name you’ll find that they have over a dozen complaints on the Better Business Bureau site and there is an alert on their page. After about a year, we did finally get them to take the site down, but only a couple months later, the site went back up under a similar name – the janitorial center dot com. Here is what they did. They joined our site with the intention of stealing our copyrighted information and selling it as their own. They downloaded private, member resources, and copied several of our content pages word for word. In fact, on some of our pages we had links to other pages within our site. They didn’t even bother to edit the content and links that go right back to our site. When our attorney sent them a cease and desist letter all they did was remove the links back to our site, which was a dead giveaway that they were stealing from us. But they refused to remove the copied content. They also bought some of the ebooks and training programs we sell and are now selling them as their own. They completely copied every one of the calculators we created for members and now have them on their site. As you can imagine, we are extremely frustrated with the audacity of these people. They even have a copyright warning that says – “Reproduction of any kind without permission is prohibited, legal action will ensue!” Give me a break!! Unfortunately the legal system says that it will probably cost us a minimum of another $10,000 to continue going after them and there are no guarantees this will even put an end to it. Obviously the legal system doesn’t work in our favor when it comes to blue collar crime. What we ask of you is that you do NOT buy into any hype you might receive from these people. They have set their sites on profiting from the work we’ve put into The Janitorial Store since 2004. We initially found out about them from a member of The Janitorial Store that left our membership to join theirs. Unfortunately he didn’t realize he had already paid for what they had on their site because most of what they had was stolen from us. We don’t want the same thing to happen to you. If you want to spread the word about what they’ve done through your networks of cleaning business owners and social media, we are not opposed to exposing them for the crooks they are. We only ask that you spell out the name as we did here and do NOT link directly to their site. Google likes incoming links and we do not want them to receive ANY incoming links – they do not deserve anything that makes them seem credible. Do You Let Your Cleaning Employees Get Away With Bad Behavior? I hear people complain about employees almost every day. Cleaning business owners complain about everything from employees that are chronically late to work, to lack of productivity, to insubordination. And yes, I've been known to complain a time or two myself. But when I think back to whose fault it was that we had such problems, I have to admit that a lot of the blame lies with me. I didn't always deal with bad behavior in a way that would turn things around and make my life and the lives of all our employees better. Sometimes I ignored the problem until I just couldn't ignore it any longer. By then it was having a negative affect on other employees. Sometimes I talked to the employee and even wrote him/her up; but then dropped the ball when I didn't follow up or didn't fire the employee soon enough. Can you relate to my situation? When I became brutally honest with myself, I realized that I wasn't happy with how I was dealing with bad behavior from my employees. That's when I decided that in order to change my employees' behavior, I needed to change myself first. So what I want YOU to do first, is ask yourself -- "How happy am I with how I deal with bad behavior from my employees?" Next I want you to rate yourself on a scale of 1 to 10. What specifically are you going to do to get your rating higher? Write down what you will do, when you will do it and how will it change your workplace. The first step is admitting that YOU are part of the problem. When you can do that, you can take the necessary steps to change the situation before it gets out of control. I'm sure you've said this to yourself a few times; I know I have. And you know what? You're probably right! No one can run your business as well as you. No one will put the same amount of time and energy into your business as you do, and no one has the passion for the business that you have. Of course not, it's your business! But if you don't let go of some of the control and let others take over some of the things you shouldn't be doing, you're going to burn yourself out. I guarantee it. I know you're going to come back and say that you hire employees and delegate tasks but they all seem to let you down at some point. They just don't clean as good as you do, they don't fill out the invoice the way you would have done it, or they don't say the right things to the clients. So what happens? You go back and re-do the work they did and end up wasting double the time! You re-clean a restroom that wasn't done to your satisfaction, and then you go clean up the equipment that wasn't cleaned to your standards. And you do it, not because you want to, but because you feel you need to. You are looking for perfection in every aspect of your business. And if you don't find it? By golly you'll take care of it yourself! Does any of this ring a bell? It should, because most of us have been there at some point in our business. We know that being a business owner means working long hours, so we spend a lot of time making sure everything is being done correctly, even if it means doing it all ourselves. What does all of this mean for your business? It means your business will not be able to survive without you. It means you'll give up precious time with family and friends; it means giving up relaxing vacations and watching your kids sporting events and school plays. It also means that you'll probably stop placing any importance on your own health and fitness, and lose sleep at the same time. You'll feel physically and mentally drained. Can you see all the negative things that will start happening in your life if you continue to feel the need to control every aspect of your business? You eventually become your own worst enemy and no one comes out a winner in the end. What I want you to do right now is think about what you envisioned when you decided to start your business. I'm pretty sure that one of the things you envisioned is freedom -- the freedom to spend more time with family; the freedom to take a day off if you want to do something fun; the freedom to buy the things you want. If freedom is what you envisioned, then why do you feel trapped? Why do you feel so tired and frustrated with how things are going? It's because you've set your standards so high that you need everything to be perfect. And when this happens, no one will ever be able to live up to your expectations, so they'll all let you down eventually. How do you break out of this road to nowhere? You make a concious choice. You can either let things continue on as they are, or you can recognize what is happening and take steps to fix the problem. The fix is not going to happen overnight. It could take weeks, months or a couple years to get things running the way they should. But making the commitment to make a change is the first step. Decide what tasks you are doing that you should not be doing. Create a written system for doing those tasks so other people can learn how to do it the way you want it done. Take time to hire the right people for accomplishing the job. Never hire based on urgency of filling the position. Instead, recruit qualified people looking for growth opportunities. Spend the time needed to train people right - never rush training. And continue to stay involved in their training and development. If they feel they have a future with your company, they will stay with you longer and strive to do exceptional work. Once you're on the right track, you'll probably rediscover the original passion you had for the business when you first started. And when that happens, you'll find more happiness in your life. Two added bonuses -- 1) your business will survive when you decide to take more time for yourself and your family, and 2) financially your business will become stronger and more stable. It's not an easy thing to do, but you only have one life and you should enjoy it. So go out and do what you need to do now to get things running smoothly in your business, and you'll find you have more time to do the things you that will make you happy for the rest of your life.